Defenders Premiere Date Revealed in New Teaser! Marvel’s The Defenders Premiere Date Revealed in New Teaser! 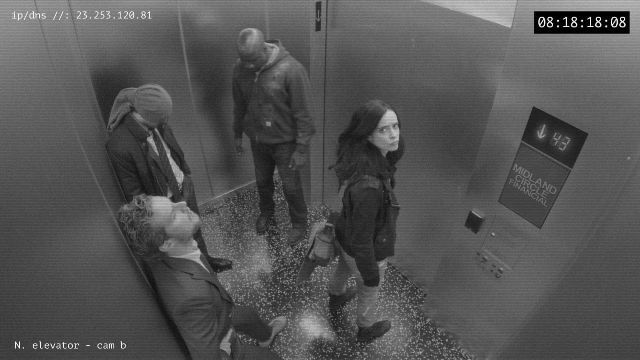 Netflix has released a mysterious new teaser online which has the vague title of “Midland Circle Security Elevator B,” but a quick glance at the video reveals the people featured are none other than the four lead characters from Marvel’s The Defenders! To make it even more interesting, Netflix has seemingly confirmed the premiere date for the series in the video, as the time stamp when Jessica Jones hits the security camera is exactly 08:18:20:17, or, August 18, 2017! Watch the video in the player below, and check out the URL — http://23.253.120.81 — shown in the video as well. This video seems to line up with a scene from the series that EW previously reported about, wherein the four heroes all arrived at Midland Circle of their own volition, not expecting the others to be there. This leads to the four of them taking part in one of their signature hallway battles, albeit on a much bigger scale.